When renting, one of the biggest decisions you’ll have to make is whether or not to share with other people. Normally, if you’re buying a property (or you own a property), then you’ll either be looking to live alone, with a partner or with family. However, for those of you who rent, it’s different. You can choose to rent an apartment by yourself or you can choose to rent a room and flat share. If you’re undecided as to which option is best for you, perhaps you should try weighing up the advantages and disadvantages of both. After all, a pro con list never hurt anyone! The most common reason for people deciding to rent a room in a shared apartment, over living alone, is simply because it’s much cheaper. In Malta, rental prices for one bedroom apartments tend to start at around €700. The cheapest areas to rent are in the south, such as in: Tarxien, Zurrieq and Zejtun. Prices in Mosta and Naxxar are pretty average and, if you’re looking to rent in somewhere like Sliema or St Julian’s, then you’ll be looking at higher prices, of around €1,000 or above. However, when you consider the prices of rooms or bigger apartments (shared between several people), there really is no comparison. If you’re new to Malta, or you don’t have a small group of people who you can share with, you could look for a room for rent. Prices for rooms in Malta can be anywhere between €300 and €450, on average. 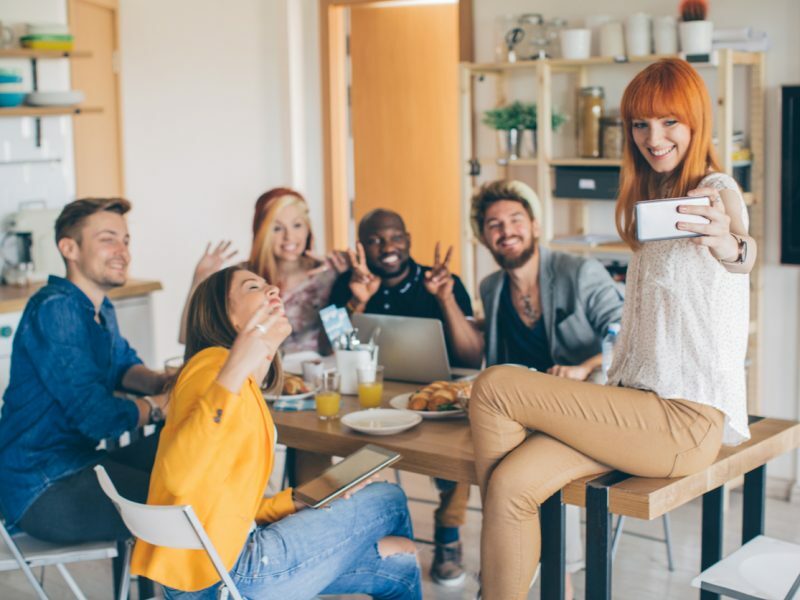 If you do have a group of friends who you want to rent with, you could get a bigger place together and share the costs. Three bedroom apartments aren’t three times the price of one bedroom flats! Renting a three bedroom flat in Malta costs approximately €1,200 although, again, it depends on which area you’re interested in. Even so, between three friends it’s much more doable and it would mean spending around €400 each a month. Taking everything into account, if you decide to share rather than to live alone, you’ll be looking at saving several hundred euros a month. On top of that, the bills will also be shared between all occupants of the apartment, house or flat. The price of an internet contract is the same whether it’s for a one bed or a seven bed place – so that would be a shared cost for starters. Water and electricity bills will also be shared. Yes, you’re bound to use more of both with more people in the house, but more often than not, it still ends up cheaper when you’re sharing the bills. The only downside to splitting bills evenly between yourself and your flatmates is that your flatmates might be more wasteful than you. Imagine living with someone who always forgets to turn the lights off, or with someone who likes to have hour-long showers! It’s difficult to keep track of these things and will be extra hassle to make someone pay more if you think they use more. Most likely, you’ll end up dividing bills equally, even though some people will use more water and electricity than others. Another drawback to sharing with others, in terms of money, is that with a shared apartment comes shared responsibility. Unless you’re renting a room directly from the owner, it’s likely that you’ll be sharing a big apartment with other people and that you took out the lease together. In this case, if one or more of your flatmates can’t afford to pay rent, for whatever reason, then you (and your other flatmates) will be liable to pay. Not only that, you might also be liable for any damages they might make to the property. So, if you’re going to do things this way, then be sure to rent somewhere with people you know and trust! Now, let’s get to the good bits about sharing with other people – and trust me, there are plenty! I’d be disappointed if anyone reading this hasn’t seen Friends. If, however, you missed out on the world’s favourite American sitcom, you’ve probably seen another, such as: Will and Grace, New Girl or The Big Bang Theory. These shows aren’t exactly true-to-life and tend to over-exaggerate things. They do, however, show us the beautiful friendships that can blossom out of living with other people. You spend a lot of time with your flatmates, if you choose to, and one or more of them may very well end up being a best friend for life. You’ll always know that, after a bad day at work, or even a after a great day, there’ll be someone at home who you can share it with. Someone who can cheer you up or someone who will help you celebrate! This will especially be the case if you and your roommates get on well. As well, if you’re new to Malta, renting a room or sharing a flat with other people can be a fantastic way to make friends. Moving somewhere totally new is never easy. But if you have people around you who can guide you, help you and support you, then you’ll definitely feel less homesick! Even if you’re someone who isn’t particularly sociable, or you’re someone who likes to have your own space, it’s still definitely a wise thing to do. Even if it’s just for 6 months or a year, as it will help you build up a friendship group. Once you’ve done that, and you feel more settled, you could then look into renting a one bedroom place or a studio by yourself. They do, however, show us the beautiful friendships that can blossom out of living with other people. You spend a lot of time with your flatmates, if you choose to, and one or more of them may very well end up being a best friend for life. There are plenty of other positive aspects to living with other people in a shared apartment! For one, you’ll always have someone to call if you lose your keys or you forget to take the chicken out of the freezer. There’ll be someone you can rely on to feed your pet while you’re away. You’ll also be able to share the chores! You won’t always be the one who has to clean the bathroom or take out the trash. That is, provided that your roommates are helpful and cooperative! There’ll always be one, though, who never washes up after themselves. Or, on the contrary, one who moans at you if you don’t do your dishes before you even sit down to eat! It’ll always be true that renting an apartment or a house with other people, even if they’re your friends, will come with challenges. Sometimes, it’s just easier to live on your own. Even though renting by yourself is more expensive, it also gives you much more freedom. What if your flatmate always wants the air conditioner set to a temperature that’s way too cold for you? Living alone means you get to make the decisions. Let’s say one of your flatmates has a job that means they come and go at all hours of the day and night? Or another who likes to play really loud metal music, or one who gets lucky rather loudly? When you’re living by yourself, trust me, it’s much more peaceful! You won’t have to wait in line to use the bathroom and you won’t have to deal with anyone’s quirks but your own. Renting an apartment by yourself will mean that you’re in control. You’ll get to decide when to turn on the air conditioning. You’ll get to choose when to clean and whether or not you feel like washing up that day or leaving it until the next. You won’t have to ask anyone’s permission before you invite friends over; throw a party or hold a Lord of the Rings marathon in your pyjamas on the sofa over an entire weekend. You won’t have to remember to put on clothes before you leave your room. You can walk around in your birthday suit as often as you like! Only you can decide whether the perks of living alone are worth the extra money, or whether you’d prefer to save on your expenses and live with other people. There are several advantages and disadvantages of both and only you will know which option is best for you. Once you’ve finished making your pro con list and you’ve made your decision, get in touch with our specialists at QuickLets! Our Lettings Specialists can help you find a one bedroom apartment or studio flat for yourself, or help you and your friends find somewhere bigger together. Get in touch, too, if you’re an owner who’s looking to rent out their Malta property!